Galileo is the first and only dive computer to have an integrated heart rate monitor, incorporating the heartbeat into the workload, and then tailoring the decompression calculations to YOUR dive. We are the only dive computer manufacturer in the world that accounts for the effect of increased workload on human physiology during a dive, and Galileo is the first dive computer to integrate a heart rate measurement into the workload calculation. Through this technology a more accurate estimate of workload is possible, and you get the safest no-stop and decompression stop calculations even under the most demanding circumstances. 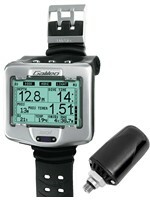 Complete navigational system with integrated digital compass and bearing memory, virtually unaffected by tilt. Ease and accuracy, all in one instrument. Extra large dot matrix display and a huge memory for unprecedented flexibility: View pictures and charts during the dive. Enjoy detail never before seen on a dive computer. Graphical charts let you review the dive profile at any time, including a complete list of deco stop times. Review the depth, temperature andheart rate profiles after the dive directly on Galileo’s on-board logbook. Galileo stores the most recent 100 hours of dive information in 4-second sampling rate, which you can download to PC via the infrared port. Hoseless gas integrated computer: when used with a Smart transmitter you get tank pressure and trueremaining bottom time (RBT) on the computer screen. Galileo can be reprogrammed through its infrared interface, meaning you can easily upgrade your computer with new functions and features downloaded from our website. Predictive Multi Gas algorithm: allowing you to enjoy the full benefits of high oxygen concentration mixes. See what you want, when you want, with Galileo’s extra large dot-matrix, available in 3 pre-configured screen display mode options: The LIGHT displayshows dive time, depth, tank pressure and no-stop information with digits that could not be any bigger. The FULL display maximizes the information shown at once: depth, dive time, deco information, tank pressure, RBT, time of day, stopwatch, active MB (micro-bubble suppression) level, temperature, heart rate, maximum depth, average depth. The CLASSIC display strikes the perfect balance between “clean & clear” and “super complete”. Depth, dive time, deco information, tank pressure, RBT and temperature are always displayed.